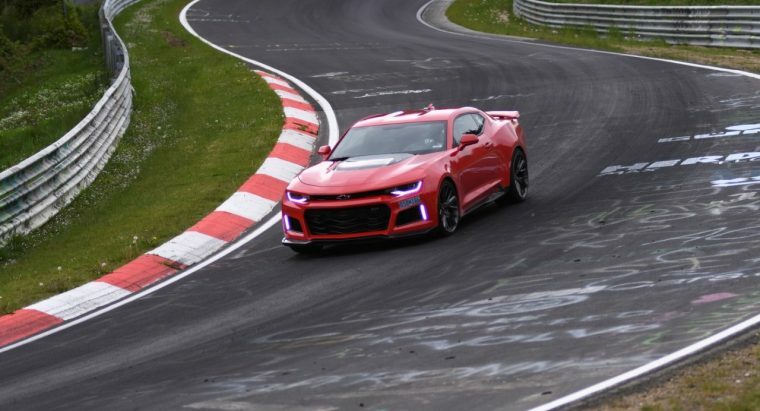 Chevy just put out a new time-attack video showing the 2017 Camaro ZL1 lapping the Nürburgring Nordschleife in just 7:29.60 seconds—a full 11.67 seconds faster than the fifth-generation ZL1’s best time. Chevy used a stock production ZL1 for the lap, with only a few modifications, which included data acquisition equipment, a roll hoop, and Sparco racing seats with six-point harnesses. The list of standard equipment includes the Camaro’s 650-horsepower 6.2-liter supercharged LT4 V8 engine, all-new 10R90 10-speed automatic transmission, FE4 Suspension with Magnetic Ride Control, and Performance Traction Management. The ZL1 also leaves the manufacturer with forged 20-inch wheels with Goodyear Eagle F1 Supercar 3 tires, Brembo brakes with front 15.4-inch rotors and six-piston calipers and rear 14.4-inch rotors and four-piston calipers, lift-reducing front fascia elements with cooling ducts and Chevy “flowtie,” full underbody shielding, ZL1-specific rear spoiler and diffuser, and 11 heat exchangers.